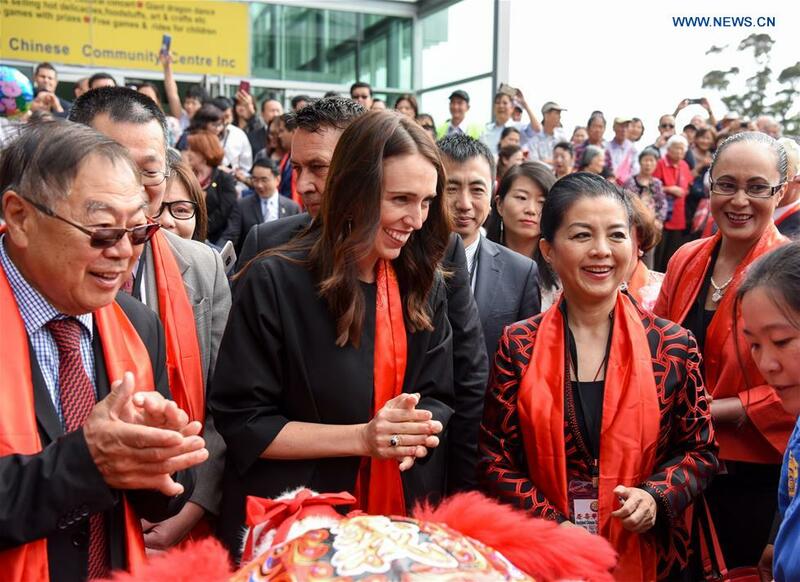 WELLINGTON, April 3 (Xinhua) -- Jacinda Ardern has concluded her first official visit to China since becoming New Zealand's prime minister in October 2017, saying her country welcomes investment from Chinese enterprises and pledging to create a favorable business environment without discrimination against any enterprise from any country. During her meetings with Chinese leaders, both sides called for speeding up negotiations to upgrade the decade-old bilateral Free Trade Agreement (FTA), continuously enriching the China-New Zealand comprehensive strategic partnership, and boosting cooperation under the China-proposed Belt and Road Initiative (BRI). During their meeting in Beijing on Monday, Chinese President Xi Jinping and Ardern agreed to continuously enrich the China-New Zealand comprehensive strategic partnership based on the principles of mutual trust and mutual benefit. Ardern's visit to China at a moment when her country was facing a special important agenda showed the great importance she and the New Zealand government attached to bilateral ties, said Xi, expressing sincere condolences for the deadly shootings in Christchurch on March 15. China has always viewed New Zealand as a sincere friend and partner, Xi said, adding that China-New Zealand ties, established 47 years ago, had always been at the forefront among relationships between China and Western countries. China stands ready to work with New Zealand to maintain their ties as a "front-runner" in relations between China and Western countries, Xi said. Under the new circumstances, the two countries need to further deepen mutual understanding and trust and respect each other's core interests and major concerns in the spirit of openness, inclusiveness and seeking common grounds while shelving differences, he said, calling on both sides to expand substantial cooperation. Although Ardern's visit was reduced to a brief 10 hours due to her intensive domestic schedule to handle the aftermath of the mass shooting, her short trip has attracted worldwide attention. "It was a very important and timely visit... I really attest to the value that this government puts on the relationship with China, and I also thought there was a number of really interesting and significant agreements between the leaders," said Jason Young, director of the New Zealand Contemporary China Research Centre at Victoria University of Wellington. Ardern's first official visit to China was well received on both New Zealand and international media, and the successful visit lays a solid foundation for improvement of bilateral ties, New Zealand legislator Raymond Huo told Xinhua. Stephen Jacobi, executive director of the New Zealand China Council, said the visit was rich in both symbolism and substance. The symbolism was that Ardern met Xi and Chinese Premier Li Keqiang and was received in the Great Hall of the People. "The images of those meetings have been broadcast around China and New Zealand to demonstrate the strength of the relationship between New Zealand and China," Jacobi said, adding that the visit also has substance, particularly in terms of trade and economy. Christchurch city councilor Jimmy Chen said it is most important for both countries' leaders to meet face to face to clear up some issues and build up mutual trust and confidence. Calling for speeding up negotiations to upgrade the FTA, Xi said China will support capable enterprises to invest in New Zealand while New Zealand needs to provide a fair, just and unbiased business environment for Chinese enterprises. China welcomes New Zealand to participate in the Belt and Road construction, Xi said, encouraging both countries to enhance cooperation in international affairs, jointly strive for an open world economy and uphold multilateralism and multilateral trading. During talks with Ardern on Monday, Li also stressed a rules-based multilateral trade system. China stands ready to synergize the BRI with New Zealand's development strategies, tap into the potential and promote bilateral economic and trade cooperation, Li said, emphasizing that the two sides should create a fair, just, transparent, convenient and non-discriminatory business environment for enterprises from both countries. Wayne Huang, principal of the East Auckland-based Institute of Commercial Education New Zealand, said China's rapidly developing economy and its large consumer base provide a huge market for New Zealand and the rest of the world. Since 2013, China has been New Zealand's largest trading partner and China's peaceful development has become an important opportunity for New Zealand, Huang said. "In recent years, China-New Zealand cooperation has expanded from traditional commodity trade to service trade," he added. New Zealand was the first developed country to recognize China as a market economy in 2004 and to sign and launch negotiations to upgrade the FTA with China. According to the Chinese government, two-way trade reached 16.86 billion U.S. dollars last year, a 14-percent increase on a year-on-year basis. As a result of such robust trade, more and more made-in-China electronics and textiles are available in New Zealand, while lamb and a wide range of dairy products like milk powder are becoming increasingly popular among Chinese consumers. New Zealand is the first developed Western economy to sign a Memorandum of Understanding on the BRI with Beijing. Also, following Ardern's visit, New Zealand Trade Minister David Parker will lead a business delegation to attend the second Belt and Road Forum for International Cooperation in Beijing in April. Jacobi of the New Zealand China Council said one particular thing his council is working on is a conference that would look at how to build a link between China, New Zealand and South America as part of the Belt and Road. Each country has to decide for itself how it wants to be involved, and there should be a uniquely Kiwi way of being involved in the Belt and Road, Jacobi said. Legislator Huo said as with other Western countries, New Zealand faces serious aging infrastructure. And Auckland could be turned into a business hub similar to Singapore to connect China and South America in terms of flights and cooperation in infrastructure, environmental protection and high-tech development, said Huo. China is now New Zealand's largest source country of foreign students and second largest of foreign tourists. The two countries unveiled the Year of Tourism one day ahead of Ardern's China trip. The arrangement was signed by the two country's premiers in 2017 in a bid to build on relationship and strengthen economic and cultural ties. "Tourism is a crucial strand in our bilateral relationship, and is a particularly important driver of economic growth," Ardern said in a message to Saturday's opening ceremony in Wellington. There was an 8.8-percent increase in Chinese holidaymakers to New Zealand from 2017 to 2018. The number of New Zealanders visiting China has also reached a new high, Ardern said. "Chinese tourists are attracted by scenic beauty and cultural diversity of New Zealand, and visitors from New Zealand marvel at China's natural wonders and rich heritage as an ancient civilization," Li said in a welcoming message. According to New Zealand government figures, around 600,000 visits were exchanged between the two countries last year, including about 450,000 arrivals by Chinese tourists. By 2024, Chinese tourist arrivals are expected to boom to more than 800,000. The New Zealand Ministry of Business, Innovation and Employment predicts by 2024 China is expected to overtake Australia to become New Zealand's largest source of visitor revenue. Tourism New Zealand General Manager Rebecca Ingram said that her agency's focus is on ensuring that New Zealand remains a desirable destination and top of mind as an option for Chinese travelers. Jacobi said the significant growth of Chinese visitors to New Zealand is driven largely by a combination of increasing wealth in China, particularly in the middle class, and the improved economic activities between the two countries. Legislator Huo said people-to-people and cultural exchanges are getting increasingly smooth between the two countries. Huo cited the ongoing exhibition of Terracotta Warriors in Wellington as an example of the popularity of ancient Chinese culture among Kiwi audience.